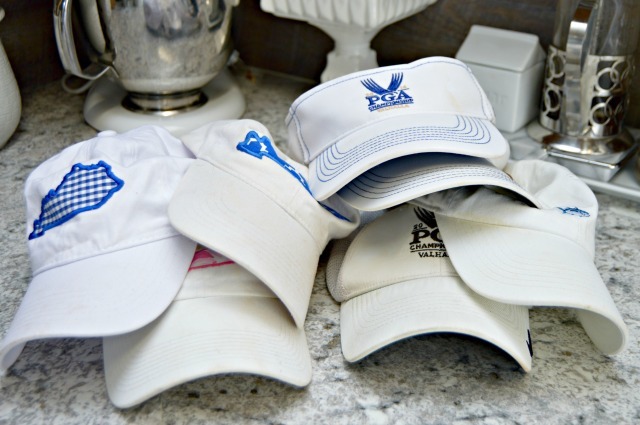 I love wearing ball caps, and I’m married to a golfer, so let’s just say, we have a lot of hats. We have them in every color imaginable, especially white! In the past, I’ve tried bleaching them, and that doesn’t work. It doesn’t remove stains and usually discolors any other part of the cap that isn’t white. 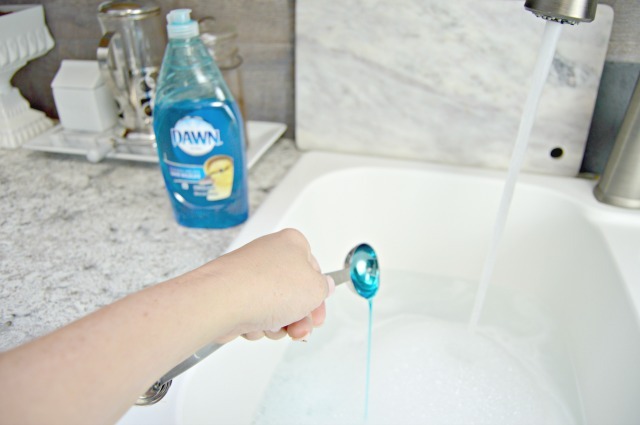 This week, I decided to try something new and wow…it worked like a charm. This works great with white hats and with a simple change up, it works great with colorful hats too. Let’s take a look at the before…I’m sure if you own hats, it’s a familiar sight! This is my pile of hats that I decided to experiment with. 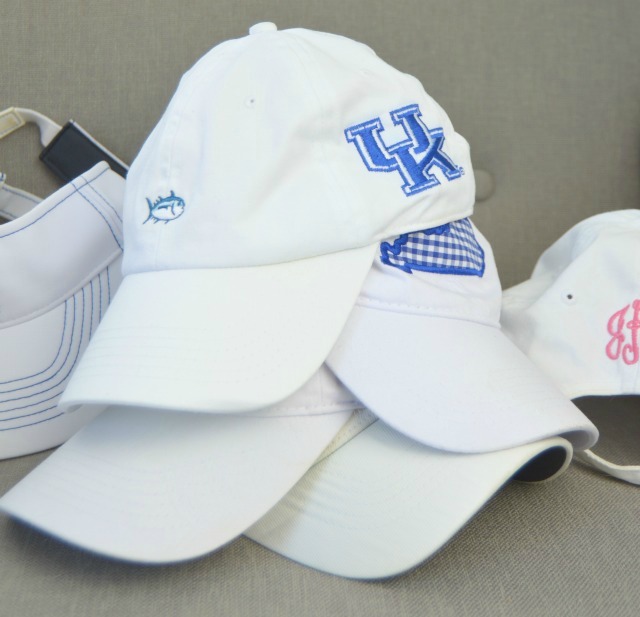 As you can see, I have a thing for hats with the state of Kentucky on them…to be honest, I didn’t really know I owned that many. The one on the far left is not as dirty as the other ones, but I already got makeup all over it, so I decided to throw it in anyway. The hat in the middle is my very favorite, and I can’t find a new one just like it anywhere. I wear it on our daily walks, to do yard work in, when I’m painting and it has a ton of stains…it’s pretty gross. OxiClean White Revive for white hats. 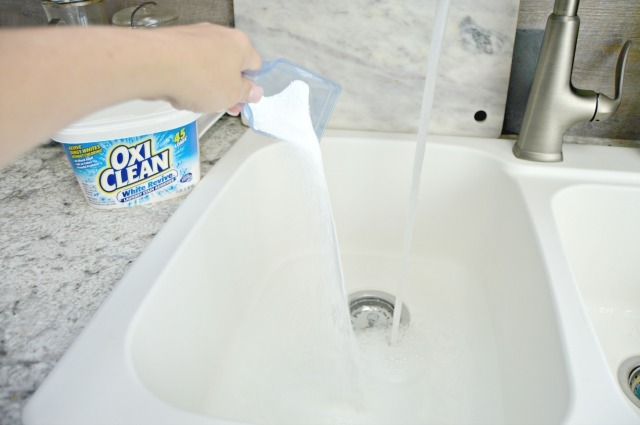 For white hats, start by filling your sink or a washtub with warm water, then add one scoop of OxiClean White Revive if you are washing white ball caps. For colorful hats, fill your sink with cold water and skip this step. You should test on a small inner part of the hat first to make sure the color isn’t going to fade. 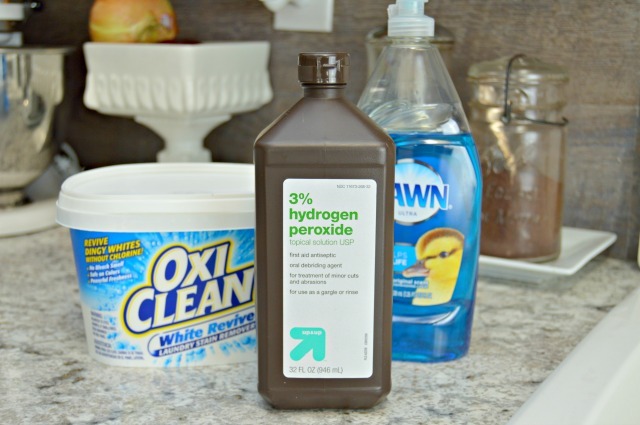 Now add 1 cup of hydrogen peroxide. Yep…just regular old 3% hydrogen peroxide that you find at the pharmacy or in the first aid section of most stores. Next add 1 tablespoon of dish liquid and stir the water around to combine all of the ingredients. 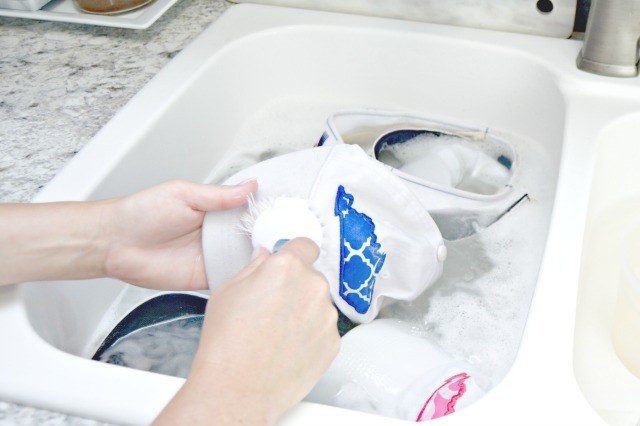 Put your hats in the water and cleaning mixture, making sure to submerge them completely. Let the hats sit in the mixture for 10-15 minutes. 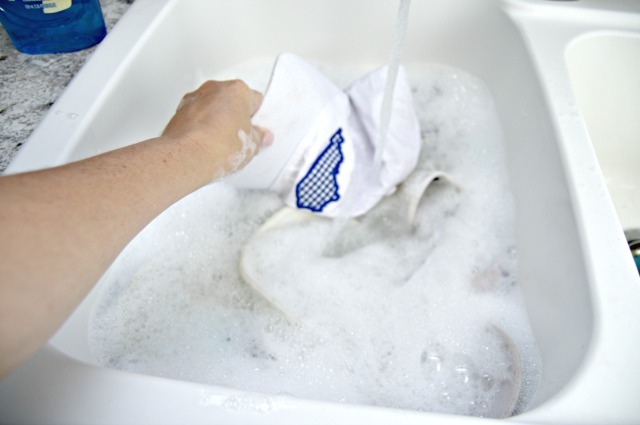 Pull each hat out and use a dish brush to gently scrub any stains, dirt or makeup until they disappear. 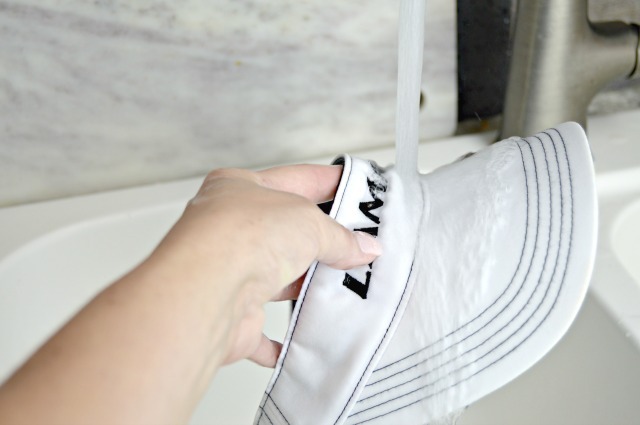 Give the whole hat a gentle scrub to remove any dirt. Rinse each hat with warm water and shake to remove some of the water. Dry them in the sun if possible. I like to place each hat on an upside down bowl to help reshape them. If you don’t have a sunny spot to dry them, you can place them on a towel somewhere inside to dry. Let them dry and bask in their glory y’all! 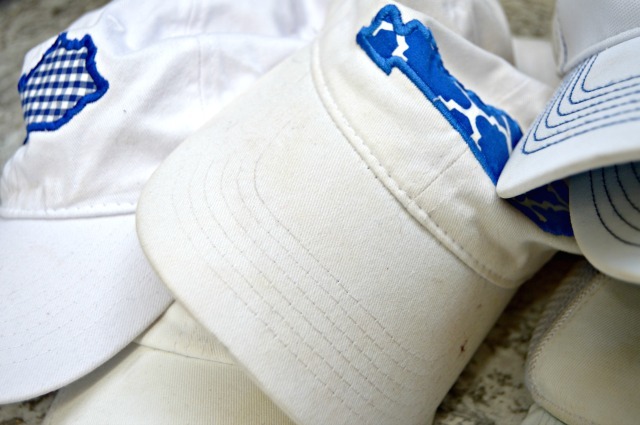 There may be a couple of spots that just aren’t fixable, but for the most part, your hats will look like new again. 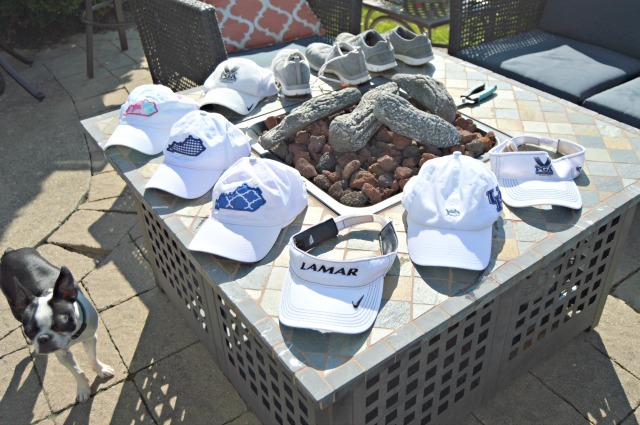 My Kentucky hat with all of the stains even came clean and my husband couldn’t believe that I got rid of all of the sweat stains on his golf hats! So, time to grab those hats and get them all clean! Do you know if this will work on a rust stain (ball marker) on the bill of the cap?? the ball cap I am trying to clean says do not wash or bleach. any suggestions?? Jessica, what about a dark bill with rust? I would try scrubbing the bill with dish liquid (something strong like Dawn works best). Or you could wash it in the washing machine, then let it air dry. Hope this helps! 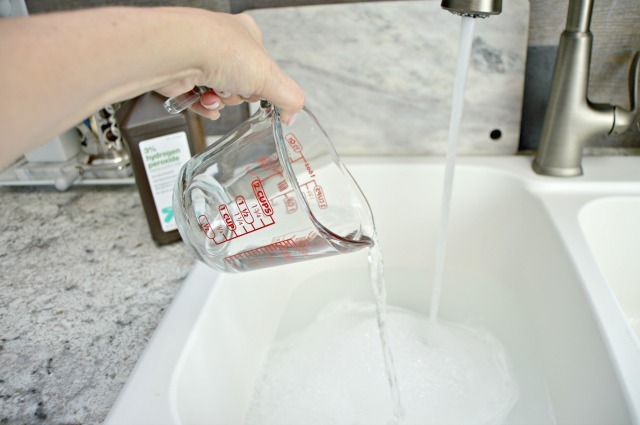 OMG, I don’t know how you do it, but you always come up with great ideas from cleaning to cleansers. Thank you so much for all you give to us. You are going to love it…I live in my white hats and it’s a true life saver! Thanks so much for the sweet word, Anne!